Tag Archives for " The Marketing Hourglass "
Marketers have long held to the idea of the marketing and sales funnel – a notion that suggests you start with a large target group and somehow squeeze a few clients down through the small end of the funnel. For years now I’ve been promoting something I call The Marketing HourglassTM, a much more holistic and increasingly effective approach in the “era of the customer” we live in today. The marketing funnel suggests that the buyer’s journey is a straight one and the we as marketers are in charge of how they tread the path when in fact so much of the buyer’s journey today happens without our knowledge and participation. Today we have to understand how the buyer wants to buy and put our businesses along that path – long before a prospect even knows they are looking for what we sell and long after we’ve transacted that sale. 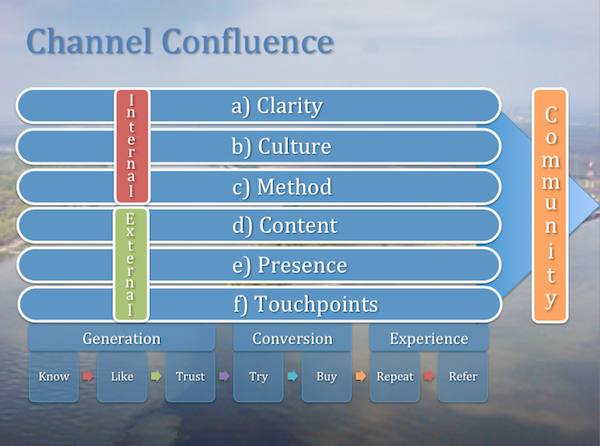 A traditional marketing funnel might have stages such as Awareness, Consideration and Purchase, while our Marketing Hourglass consists of seven connected stages – Know, Like, Trust, Try, Buy, Repeat and Refer. Here’s the thing that the marketing funnel neglects to address – when it comes to lead and referral generation a happy customer is your best tool. By taking the marketing hourglass approach and giving equal attention to building trust and delivering a remarkable experience, you set your business up to create the kind of momentum that comes from an end to end customer journey. In order to apply this framework to your business your must get a baseline on how your business interacts with prospects and clients currently, understand how your prospective customers make a buying decision and construct an hourglass journey that guides prospects through the logical stages of your marketing hourglass. The first step is to take stock in the ways that your business comes into contact with customers and prospects. Experience tells me that some of these ways are planned and scripted, while some are not. Some happen by accident, while some simply don’t happen at all. For example, a very common gap in the businesses we work with exists in the transition from transaction to implementation. Marketing and sales got the order, but what happens next? Another very common mistake is to believe that all you have to do is run ads and respond to requests when, in fact, many potential buyers want hand holding and nurturing and follow-up in order to know you’ll deliver on your promises. One of the hardest things for many business owners to do is to put themselves in the shoes of prospective clients long before that client knows that you have the answer. We often want to convince people we can solve problems they don’t even know they have. In order to effectively build your Marketing Hourglass you must fully understand the questions your prospects are asking themselves before they are aware that you or you solutions exist. 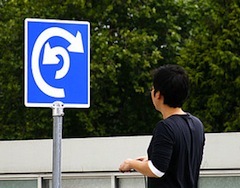 For example, if you sell signage, you must start to build awareness through your marketing to prospects, not by explaining how great your signs are, but by addressing ways that businesses can build a stronger culture, attract more clients and make it easier for customers to find what they need – all great uses of signs by the way. Now that you’re thinking touchpoints and journeys you can start to fill in the logical stages of your hourglass with the campaigns, process and touchpoints that will lead to a great experience. Know – This is the awareness phase so articles that do well in search, advertising and even referrals need to start here. Like – This is the stage where once you attracted them to your site you have give them reasons to come back, reasons to relate and even reasons to like your team. Trust – In this stage, reviews, success stories and client testimonials are your currency. Try – Now that they are wondering how your solution might work for them it’s time to shower them with eBooks, Webinars and very detailed how to information. You might also have an evaluation, trial version or low cost option to offer here. Buy – For this stage the focus is on keeping the experience high. 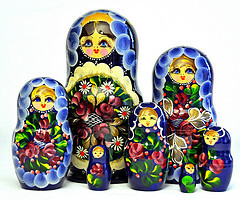 Think about how you orient a new customers, exceed their expectation and even surprise them. Repeat – Perhaps the best way to get repeat business is to make sure your clients receive and understand the value of doing business with you. Here’s where you need to consider adding a results review process as well as additional upsell and cross sell touchpoints. Refer – The Marketing Hourglass journey is ultimately about turning happy clients into referral clients. You do this first and foremost by creating a great experience, by being referral worthy, but you also have to build processes and campaigns that make it easy for your champion clients to introduce and refer your business. 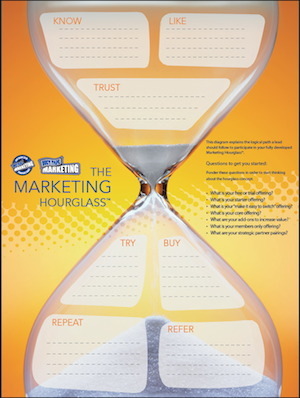 A fully developed Marketing Hourglass is a thing of beauty, but it’s never really done and you can always go to work on adding to it and making it better. Monitor and measure the places where people don’t seem to move easily to the next step and make conversion of each step job #1. Every time you enter a new market or develop new product or service you can use this framework as a way to make sure you create the perfect end to end customer journey for every offering. Do you know what’s one of the big problems for small business owners and entrepreneurs? Having too many answers. In fact, they often have so many ideas, notions and answers, they can’t stay focused on any one thing long enough to know if it’s THE answer. For many entrepreneurs the constant storm of ideas and answers is a trait, for others it’s an affliction. Experience tells me however that having the right answers isn’t nearly as valuable as focusing on the right questions. When you can focus on creating priorities through a framework of customer focused questions, the answers you need in order to create growth, or for that matter, strategy, campaigns and internal processes, will magically present and order themselves. Below are seven questions that can help organize your priorities and create the answers you need to keep locked in on growth. 1) How will people learn about our value proposition? Creating and communicating just how your business is different from everyone else that “says they do what you do” is job number one. As you plan for growth you must know this difference and you must chart all the ways you will get it in front of ideal prospects. 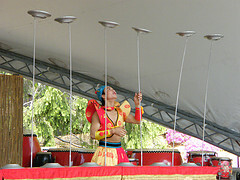 This typically takes the form of advertising, public relations, referrals and partnerships. 2) What will make them want to know more? It’s not enough to run an ad and think this will build the kind of trust needed to make a purchase. You must have an entire education pipeline in place so that a prospect can wade in and learn and experience how you’re different. Often this step is achieved through content such as blog posts and eBooks. 3) What will lead them to give us permission to share our story? This question really gets to the heart of the trust issue every business faces. The right to tell your story, what really makes you unique, is something that’s earned. This is also the place where your reputation is measured. Prospects that have come to this point are interested in what you do, now they need to learn how you do it in a way that corresponds with their values and beliefs. Often, reputation management, reviews, SEO, content and customer stories make or break this element. 4) How can we offer proof that they can get the result they desire? It’s not enough to simply make a promise these days. You must find ways to offer substantial proof that you can deliver a result. Case studies and customer testimonials are a great place to start, but nothing beats a real life experience. This is the place where trial offers, evaluations, workshops or freemium versions of what you do can allow people to sample your brilliance in a lower risk form in order to make the decision to make a full purchase more easily. 5) How can we make the buying experience fun, effective and convenient? Once someone says yes you need to go to work on reselling them and making the experience they received in the sales and marketing phase of the relationship just as good in the customer aspect of the relationship. One of the best ways to initiate this is through a formal new customer orientation process that includes education and information coupled with some sort of surprise. It’s incredible how often attention to this question leads to referrals and word of mouth buzz. 6) What can we do to measure and ensure our customer gets the result they expected and more? Sometimes, through no fault of our own, a customer doesn’t get the result they had hoped for. There can be many reasons for this, but focusing on building a process of measurement is crucial. This allows you to fix any lingering issues, but it also allows you to celebrate the value you bring to most customers and use that as both proof and validation for raising your prices. Create a results review process and make it part of your growth plan. 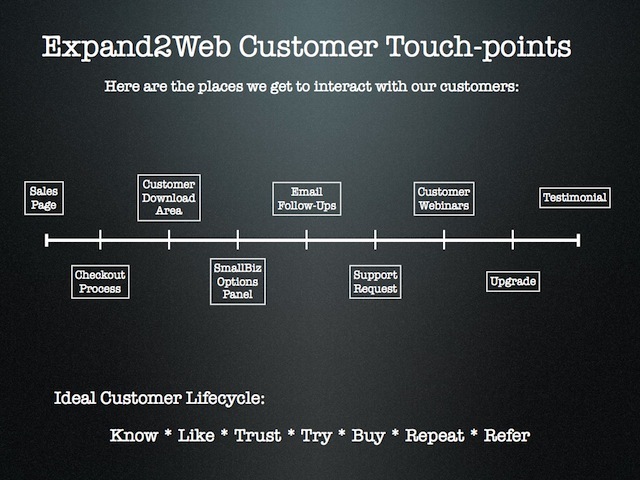 7) What will lead every customer to talk about us to their friends, neighbors and colleagues? This question could go on the front end of this post as one of the best ways to improve your business is to begin every client relationship with a referral in mind. At the very least, you must start to think in terms of moments of truth, or touch points where you plant the seed for referrals. One of my favorite places to do this is during the lead conversion or sales process. Tell every prospect that you know they are going to be so thrilled with the work you do with them that they will want to tell others how they can receive this kind of valuable experience as well. For some time now I’ve been sharing a concept I call The Marketing HourglassTM. I truly believe it’s become the most significant thing I’ve contributed to the concept of marketing. The Marketing Hourglass takes its cue from the long established marketing funnel, but what’s it is really all about is building trust and focusing on turning that trust into repeat business and referrals. See, I firmly believe that a happy customer is your best tool when it comes to lead and referral generation and The Marketing Hourglass is all about shifting the focus to conversion and referral. The central idea is an intentional plan to move people logically through the hourglass stages of know, like, trust, try, buy, repeat and refer. You do this by creating products, services, touchpoints and processes aimed at moving people to the next stage and next stage. The interesting thing about this framework is that you can apply it globally to a business model, content plan or product launch equally. 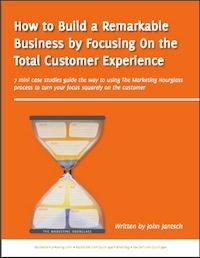 I’ve assembled pretty much everything I’ve written on the use of this tool, including a full color infographic that you can use as a guide for creating the various elements of the hourglass application, into free eBook I’ve called – How to Build a Remarkable Business by Focusing On the Total Customer Experience. Download your free copy here and the entire process of marketing will make so much more sense. A referral is the result a job well done, exceeded expectations and delivering an experience worth talking about. Most assume it happens after the fact, but I’m here to tell you it can happen consistently and predictably before the fact if you begin every decision you make with a referral in mind. 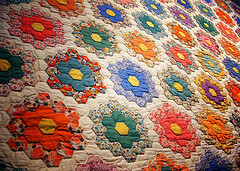 My Grandmother was an old school, every stitch by hand, quilter. She made every one of her grandchildren and every one of her thirty plus great grandchildren a quilt. I remember asking her how she did it and she told me that she always just began with the end in mind. She would make hundreds and hundreds of decisions about where she was going because she had a single minded goal in her head. Let me ask you this – What would need to change if you were to wake up tomorrow and proclaim that every single one of your clients would be so well cared for they would naturally refer their friends and colleagues? If a 100% referral rate was now your new standard of success, would that make you pause and reflect on just about every element of your business? Would that make you think about how to over deliver as a design element of your products and services? Would that make you think about ways to ensure your clients got the results promised? Would that change the way you followed up 45 and 90 days after the sale? Would it make you start introducing the idea of a referral during the sales process? Could you confidently assure a prospect that they would be so happy with the result of the purchase that they would want to refer – before they ever became a customer? Would it make you reassess ways you build trust? Would it make you freely give away information and training that is better than what your competitors charged for? Would it change how you more fully integrated social media, content and SEO? Yes, referrals happen because of what a referred prospect finds when they search. Would it change your idea of what an ideal client looked like? Remember, one of the surest ways to generate referrals is to attract clients that fully appreciate your unique way of doing business. So you see, referrals don’t just happen because of what you do after you have a satisfied client, they happen because of every thing you do before you even attempt to ask for the referral. A referral happens most when you begin with the referral in mind.